The Day field of your Lesson Plan items represents a day of school work. The items that you want to accomplish on the first day you use a Lesson Plan will all get a sequence number of 1; the items to be done on the second day that you use the plan will get a sequence number of 2. It does not matter if the actual dates on which the work is done are sequential or not. Days 1 and 2 could be Monday and Tuesday in the same week, or September 1 and October 1, whatever meets your needs for the area of study. You can place each item on a separate Day number, or you can have multiple items on the same Day number. For example, if you have a Grammar workbook that has 180 lessons, you might create a Lesson Plan where you have one lesson per day so that it spreads out evenly over your school year. If you also have a phonics workbook, you might choose to put that in the same plan, and have a phonics lesson every other Day - so that one day there is just a Grammar lesson, and the next there is a Grammar and a Phonics lesson. You can create any pattern you like with your plans. See the Creating a Lesson Plan with Repeating Pattern Help Page for specific instructions on generating a plan which has a repetitive pattern of activity types, such as a math curriculum with X number of lessons, followed by a test, followed by more lessons, followed by a test, etc. 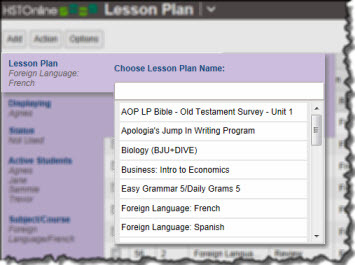 Use this option to create a single Lesson Plan entry. 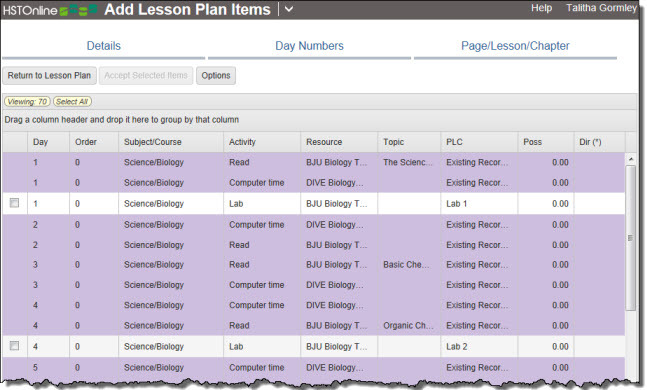 To create similar multiple Lesson Plan items at the same time, see the Adding Multiple Lesson Plan Items section. 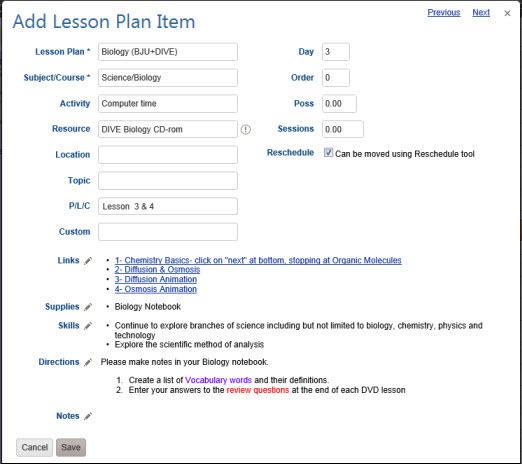 On the Lesson Plan page, choose a Lesson Plan to view by clicking or touching 'Lesson Plan' in the filter panel. type in a new Lesson Plan Name that you want to create. The new plan name will be added to your Lesson Plan Names list as an active plan. Click the Add button and choose Add - Single. The only required fields are: Lesson Plan and Subject/Course. Fields and features which have been disabled in Program Options will be hidden from view in the Add Lesson Plan Item window. Fill in information as needed. The only required fields are Lesson Plan and Subject/Course. Add as much additional information as you like. Do not force yourself to use fields that add no value to your own homeschooling records. You can always come back and add additional information later if needed. Below, the parameters of each field will be outlined. The Lesson Plan, Subject or Subject/Course, Activity, Resource, and Location fields are all Smart-Entry Fields. To make an entry in one of these fields, you can press the space bar to see all available options, or you can begin typing to limit the options available. Smart-Entry fields allow you to create new entries for each of these fields 'on-the-fly'. Simply type in the new entry you need and HSTOnline will automatically add it to the appropriate list. See individual field notes below for more information. Lesson Plan: This field will be auto-filled with the name of the Lesson Plan you are currently viewing. You can change the entry if you like. If you do, when you save this Lesson Plan item it will be added to the Lesson Plan you selected here. The Lesson Plan field is a Smart-Entry Field. Press the space bar to see a list of all active Lesson Plan Names. You can begin typing the name of a Lesson Plan to see a limited list of options based on the letters entered. Click or touch the entry you want to use for this Lesson Plan item. If you add a new item to the Subject/Course field, when you Save this Lesson Plan item you will be prompted to choose whether the new entry is to be used as a Subject or as a Course. See below. Resource: This field is optional. Use the Resource field to display the name of the book, text or workbook the Student will be using to complete the work. Location (Loc): This field is optional and is disabled by default. Use the (Assignment) Location field to note where the learning took place. This is helpful in jurisdictions where you need to keep track of the number of hours of schooling that take place in the home vs. elsewhere such as a co-op, community college, etc. In the Lesson Plan list the Location field column is labeled 'Loc'. Topic: This field is optional. Enter a theme for the Lesson Plan item. Custom: This field is optional and is disabled by default. This text field allows you to enter any additional information about the Lesson Plan item, up to 150 characters. Day: Enter a Day number for the Lesson Plan item. The Day number is the field that determines the sequence of your items within the Lesson Plan. Work that is to be assigned on the same date should have the same Day number in your Lesson Plan. You can use the Change Day Numbers action to reorder your Lesson Plan items at any time. Order: This field is optional and is disabled by default. If you have more than one Lesson Plan item with the same Day number, you can use the Order field to indicate which items should come first, second, etc., in that slot. Possible: If desired, you can pre-enter the number of Points Possible for the Assignments that will be created from this Lesson Plan item. If you have disabled Grading, these fields will not appear. If you are entering this Lesson Plan item after the work has been completed, enter the Points Earned in the 2nd box. Please see the Grading Help Page for detailed information about how grades are entered and calculated in HSTOnline. Reschedule: A checkmark in this box allows Assignments created from this Lesson Plan item to be moved forward or backward in time when using the Reschedule feature. The box is checked by default. The column name for this field is Resch. 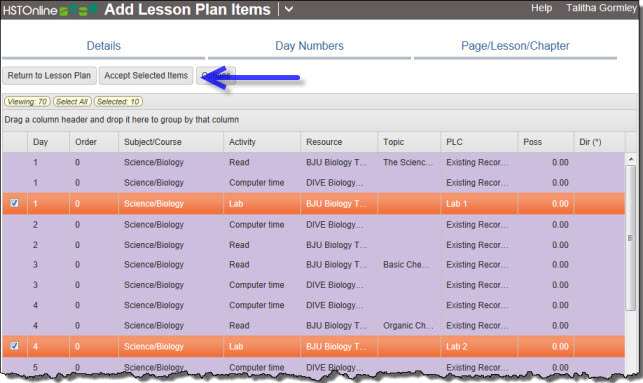 In the Lesson Plan item add/edit window, the added links will be displayed; in the Lesson Plan list Links column, the number of Links that have been added to the Lesson Plan item will be displayed. In the Lesson Plan item add/edit window, the added supplies will be displayed; in the Lesson Plan list Supplies column, the number of distinct Supplies that have been added to the Lesson Plan item will be displayed. Click or touch a skill to select it; click or touch 'Add Selected Skills' to add them to the Current Skills area; click or touch Save to add them to the Lesson Plan item. In the Lesson Plan item add/edit window, the added supplies will be displayed; in the Lesson Plan list Skills column, the number of Skills that have been attached to the Lesson Plan item will be displayed. Click the Save button to add the Directions to the Lesson Plan item. Click the Save button to add the Notes to the Lesson Plan item. Cancel to abandon the new item without adding to your Lesson Plan. Save to add this item to your Lesson Plan. The 'Add Another' hyperlink in the top right corner to save this Lesson Plan item and add another. You can click 'Add Another' each time until you have entered the last new Lesson Plan item needed and then click the Save button to end the Add process. 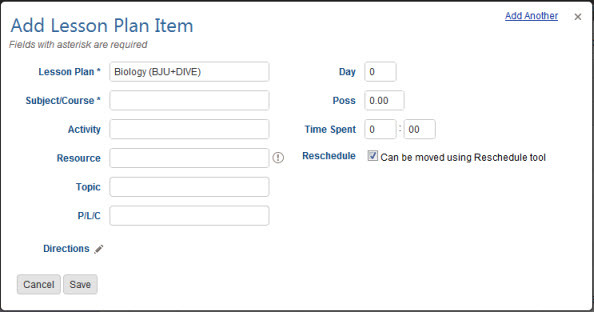 Cancel to be returned to the Add Lesson Plan item window to make a new selection in the Subject/Course field. The steps below show how to create multiple items for a Lesson Plan that share the same Subject/Course designation and can also share other features such as Activity, Resource, Location, Points Possible, etc. This action can help you quickly create the 'bones' of a Lesson Plan. You can always go back and edit or multi-edit the created items to make adjustments to the individual items or groups of items at a time. Click the Add button and choose Add - Multiple. 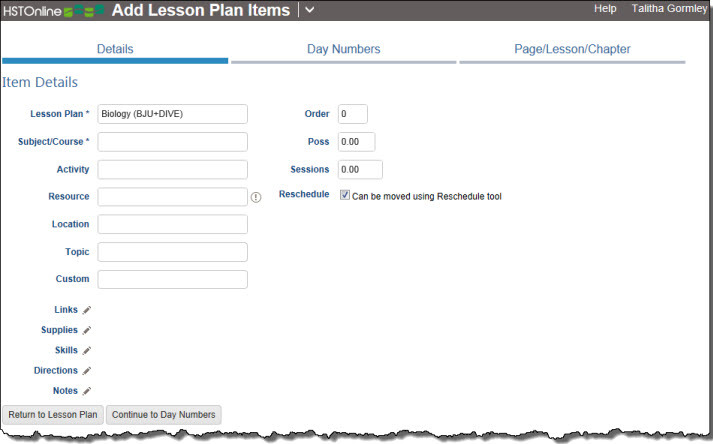 The 'Add Lesson Plan Items' form is a tabbed area: Details, Day Numbers, and Page/Lesson/Chapter. The active tab area will have a thick, blue underline. Click on any tab name to move to that area. You can move back and forth as many times as you need as you adjust your option settings. The only required fields are: Lesson Plan and Subject/Course in the Details tab. Details: Fill in information as needed. The only required fields in this area are the Lesson Plan and Subject or Subject/Course field. The Lesson Plan field will show the name of the Lesson Plan you are currently viewing. When creating multiple Lesson Plan items, the Page/Lesson/Chapter field is completed in the last tab area so that field does not appear here. Return to Lesson Plan to cancel this process and return to the Lesson Plan list. Continue to Day Numbers or the Day Numbers tab to move to the next set of options. Start On: Enter the first Day number you want to use for this series of Lesson Plan items. The default entry is 1. Skip over Day Numbers that are already in use: If there are existing items in the Lesson Plan you are working with, you can check this box to have HSTOnline skip over any Day Numbers that are already being used for other items in the Lesson Plan. This will prevent you from doubling up with two or more items on the same Day number. Example 1: The Lesson Plan already has items on 1, 6, 11, 16, 21, 26 and you create 6 more items, starting on 1, inc by 5 and skip over existing day numbers, the new items will have Day numbers of: 31, 36, 41, 46, 51 and 56. Because HSTOnline will start looking for available numbers on Day 1, then add 5 and continue doing so until it finds the first open number that is 5 greater than the previous attempt. Example 2: The Lesson Plan already has items on 1, 6, 11, 16, 21, 26 and you create 6 more items, starting on 2, inc by 2 and skip over existing day numbers, the new items will be Day numbers of: 2, 4, 8, 10, 12, 14. Day 6 will be skipped because it is already in use. The Preview screen will show you the new items you are creating along with the existing items in the Lesson Plan so you can evaluate whether you set the Day number start and increment the way you need them for the overall Lesson Plan. Return to Agenda to cancel this process and return to the Lesson Plan list. Same Page/Lesson/Chapter: When the PLC field is enabled this is the default selection. When you choose this option, the same text - or no text - will appear in the Page/Lesson/Chapter field of each Lesson Plan item. Continue to Preview to see the list of Lesson Plan items that will be created based on the options you have set. If you choose 'Continue to Preview', HSTOnline will show you the Lesson Plan that will be created based upon your option settings, along with any existing items that are already in the Lesson Plan. Existing items in the Lesson Plan will appear in the Preview with a lavender background. Take this opportunity to review the items before accepting them to be added to your database. The Preview will show you all items, sorted by Day Number. You can group or sort the Preview list in any way you like and HSTOnline will remember those settings each time you return to the Preview list. If the results are not what you expected, you can click or touch the Details, Day Numbers, or Page/Lesson/Chapter tab to reset your options and then click or touch the 'Return to Preview' button to see the new results. you can click or touch the checkbox for each Lesson Plan item you want to accept. Return to Agenda to abandon this process and return to the Lesson Plan list. Accept Selected Items to add the highlighted items to your Lesson Plan.